In today’s economy, everyone is an entrepreneur - or at least, should be. The full-time elementary school music teacher has a side gig playing piano at a local wine bar. The customer service rep at the bank makes elaborate custom birthday cakes on the weekends. And the accountant by day has launched an antiques refurbishment business. The success of each of these endeavors will depend, in large part, on how much effort these enthusiastic entrepreneurs put into promoting their businesses. And that, in turn, depends on how effectively they employ an often overlooked, but potent, weapon in the business owner’s arsenal - public relations. Many new and small business owners make the mistake of imagining "public relations" to be irrelevant to their business. Others think PR is something that only big companies do. Yes, big companies usually have in-house public relations teams or contract with support agencies, but small companies still engage in public relations. Maybe they don't call it that, and maybe they don't realize they're doing it -- which likely means they're doing it ineffectively -- but they're doing it. Your company is going to do it, too - so do it well. The first place to start is by having a story to tell. 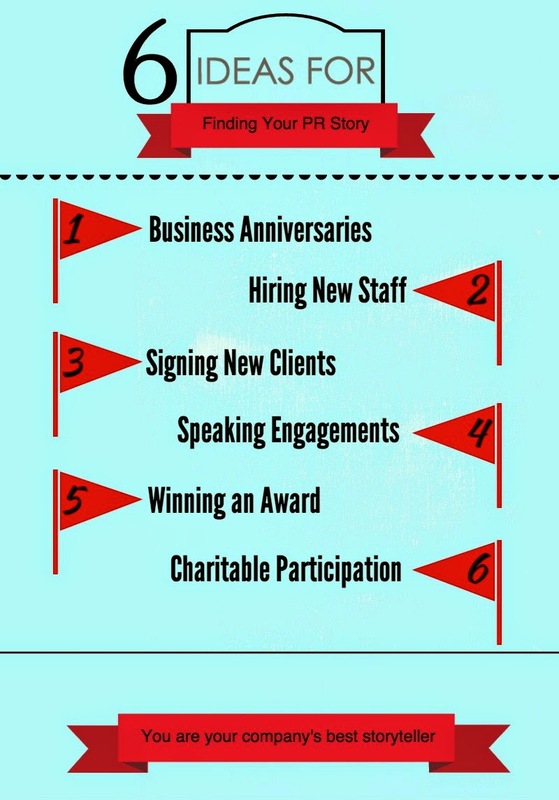 Has your business celebrated an anniversary? Five, 10, 15 years in business - these are all great milestones that give a reporter a good reason to do a feature story on your business. Have you hired anyone new? If you’ve hired a new team member who has established credentials in your industry or community, that’s good news and worth sharing. Have you acquired a significant new client? With the client’s permission, and if it fits within your strategic plan, announcing a new client can be a good idea, particularly if that client comes from an industry sector in which you want to grow your business. Are you scheduled to speak at a conference or workshop? Sharing the news about the presentation can both help boost registration for the program - something the organizers likely would welcome - and help establish you as a thought leader on that topic. Have you won an award? Whether your business was voted tops in an annual survey or an individual team member was honored by a business group, awards are great to publicize. Are you participating in a program that has wider appeal? If your accounting firm, for example, donates time to a social services agency to help low-income clients file their tax returns, getting the word out about the program helps the agency, the firm, and the clients. Chances are, your business has news that fits into one of these categories, and if you don’t now, you likely will sometime soon. In our next post, we look at how to get these stories in front of the people who care about them. It’s Almost Flu Season. Are You Ready?